The reason we are not to worry about tomorrow is not because from here on out its perfect! No, Jesus said there Will be trouble! But When we have a personal relationship with Him , we are putting our thoughts, concerns and ALL of our unknowns into His Secure Hands. The Worry is to be Replaced with Trust! Its not a Trust in the world or ourselves or any other person, that will end up in failure for sure! It’s a Trust IN HIM, no matter what it looks like around you! The assurance is That your God Has this! The bible says He goes Before us! With this knowledge comes the gift of Faith and From that The Gift of Peace! First of all earthly life is Not promised. Second He Knows the Plans and Has Known them before We were Born. A plan to Prosper, and not harm, a Plan for Hope and a Future. A Future of a Promised Eternity! There is no greater assurance than that! So Why wait to Begin something that was set Before You existed? Why Postpone a Personal Hand Crafted Life? Why waste that Beautiful Gift of Peace? Life here is to be lived with all your heart, soul and mind pointing Right at Him. There is One Way and No Better Day, Than Today! TODAY, Accept Jesus as Your Savior and Lord Of Your Life! Too much time and energy has been wasted on Worry and uncertainties! I hope that Today, If He knocks you will Open and let Him Step In! Seize the day while it is still called today! I’m thankful for having a God who is understanding of the hardships within a human life. I am thankful for the hope and comfort that comes from knowing that. The scriptures say that Jesus did not do many miracles within his home town, because of the lack of Faith. This verse can be encouraging for a follower who is on Fire for God, but finds it difficult to reach loved ones. Do you have a loved one in your heart and on your mind today? Maybe your heart aches because you know their best is yet to come. You know The Hands that are ready to hold, you know the Love that waits to cradle. You know the ONE who cherishes them. You want nothing more for them, than to accept all of this with open arms. It is a blessing to wake up everyday with the desire to share God and His Word! Although at times it can be sad and discouraging, when the people in your own home or in your family do not take it Seriously. It affects us deeply because we know that it is serious, life or death serious. These are the questions I’v personally asked within prayer, Am I doing something wrong? Have I not shown Who You are within the actions of my own life? Have I not loved enough? Have I not spoken up at the right times? Have I spoken too much? Why aren’t they getting it? Why don’t they have that burning desire to know You Lord? How can anyone not want this????? Here is where His loving Counsel comes in. The Words that Jesus spoke in Mark 6:4. show us that he understands our struggle because it was first his to deal with. With that thought in mind remember that it is STILL His. Yes, It hurts when we see so many lost and living in despair, but we must remember He created us to be disciples, we are to share the good news, but ultimately we can not control who receives. What an understanding God we have! So just as he is understanding to our struggle right now, we have the comfort in knowing that he has an ultimate love and understanding for the lost. He has a backstage view of their hurt, their pain, the temptations they face day in and day out. With that being said he knows exactly what they need and He knows how to prepare the soil of their heart. It will Always be the hope that our loved ones will be safe within the arms of our Savior. We hope and pray that they will taste and see that He is good but we must remember that there is a process. Although we feel the urging of time getting shorter and shorter, we know that God can do amazing things within a short amount of time. Hello the entire universe and everything in existence came about in 6 days and he still had time to rest and reflect on how awesome it was. In Luke 8, Jesus used a wonderful example of seeds being sown. The growing conditions played a major role. When the seeds were tossed, Some fell on rocky ground, some were choked out by weeds, some were eaten up by birds and trampled by foot. But others fell on fertile soil. The soil needs to be ready. We must remember Who Softens that soil, Who penetrates the roughness, Who nourishes with the Living Water. And We TRUST that His timing is on an entirely different level than our own. TRUST That It is HIS Power that will touch the Hearts of our loved ones. Continue to Love ..Even when it is difficult! Be still when He says to be still! He Doesn’t Give up.. so we shouldn’t give up, continue to share that Knowledge that leaves hearts wanting to know more! Don’t get ahead of yourself and don’t get ahead of Him! Keep Sowing and Let God do the Growing! What if we actually Believe in God’s Work? This is from a beautiful song by Natalie Grant. I really like a song that will basically allow for a good self check. And this one does just that. It’s So true! We do it. Seriously..,Who do we think we are? We try to take our lives out of the hands of God. Anxiety, Stress, Worries, they all stem from very real situations. There is no lie about that. So often we put more confidence in the severity of the problem, rather than focusing on The Severe and Powerful God we have! It’s true that many of these worries are about struggles that can be life altering, there is no arguing that! What if during the process of this alteration, we learn to embrace the shift. What if Instead of expecting the situation to change when we want it to or how we want it, we set our focus on a sure bet. God’s Goodness, His Love, His Provisions! I CAN Expect God to be Who He IS! I know what I’d like to happen, I know how I would hope for this to turn out, but better yet, I want to see God’s Expectations fulfilled! The situation may not be ideal, but I Can expect God to do something extraordinary In it, Through it and From it! Look at it in this way! This is happening in an imperfect life, in an In perfect world, it its ugly, but My God is Perfect! He Is The The Master at working All things for the Good of those who love Him! He knows the yuck of the world, but more importantly He knows The Beauty of what He can do with it. I’m not saying there won’t be pain or uncertainty, but what if we Trust that God will do something Glorious? What if, we Trust that out of this darkness there will be a clarity like no other. What if, while In it, we accept the peace and security that He freely gives, and we remind ourselves that God is just. What if through it, we learn something? What if from it, we are positioned for something that is for a far greater purpose, one that our limits can’t fathom? What if from enduring, we come out of the other end and we are able to see others in a different way? What if through this darkness, God is creating opportunities for the scales on our own eyes to fall? What if this is the moment to cultivate compassion? We know that His plans are to prosper not to harm, what if we Trust that? What if while in the dark, He is polishing us in a way where we can reflect his light more than we could have before we entered? Think of a Diamond, its found in a dark cave but once it’s been cleaned chipped and shaped, it’s buffed and boy does it shine! We are the same, He finds us in the dark and What he can do with our mess is incredible. We need to stop trying to make sense of the process and instead expect that there will be something that shines! A blazing instrument that He can now use for His Perfect Purpose. What if, we believe the scriptures that we read Day In and Day Out? Trust In The Lord with all our hearts and lean Not on our own understanding. The next part is a Promise! He will make the path straight! Hand it to the King and leave it there! Put The Power where the Power Belongs! Thanks Be To God we are given the Victory Through our Lord Jesus Christ! I opened to Daniel this morning and I was drawn to a portion I had highlighted from a previous reading. For me it’s such a beautiful reminder that God IS LISTENING! Not Only that, but He Answers. Then he said to me, “Do not be afraid, Daniel, for from the first day that you set your heart on understanding this and on humbling yourself before your God, your words were heard, and I have come in response to your words. Do Not Be Afraid! Your God is on the job! From The FIRST DAY that he set his heart on understanding, Daniel’s words were heard. From the first day! I love that reassurance. Then a little further down in Dan 10:19 Daniel is told again Do not be afraid. Peace be strong now, be strong. His response comes with His Presence. His Peace whispers do not be afraid, it opens our hearts to His counsel. It leads us into a rest. His Strength lifts us into a secure and fortified position. Our feet are set secure and Firm on His Name! The Lord Continues to remind us all through out the scriptures to Seek Him and to remember that He is a God of deliverance. I Am with you.. To Deliver you. When the Lord is In our Midst there is no reason to fear. He wants us to Boldly come to the throne. It was His doing that made that possible. 14Therefore, since we have a great high priest who has passed through the heavens, Jesus the Son of God, let us 16Therefore let us draw near with confidence to the throne of grace, so that we may receive mercy and find grace to help in time of need. I hope That whoever reads this today is blessed with the understanding that His Love is For You. May you come to His throne with Confidence. He is Listening, come KNOWING That He Will Answer! If You know Who you are In Christ, then the second portion of this scripture makes perfect sense. We can not reflect what we do not know. Many do Not Love who they are at all, in fact we have some real self loathing going on. We allow our past to create the internal image. We hold onto regret, shame, fear, resentment, pain, anger, jealousy, and failures. We hold them up and we look into them as if we are looking into a mirror. It distorts the way we see ourselves as well as the way we view the people around us. The perception of the outside begins to reflect the ugly that’s held within. So many times we are staring right into a pool of deception, we look to the world to become our mirror. In reality what the world determines as beautiful, will soon perish. Are we seriously letting the perishable guide our self worth? We allow ourselves to believe that our worth is found in possessions and people. We even base our worth on our struggles. Let me tell you no one is without a struggle! Everyone has them. But they do not need to define us. The world would rather encourage us to stay under the control of our weaknesses. It passes out the labels and we accept them proudly. We wear them around like name tags. We would rather proclaim these labels on ourselves, rather than Claiming The Name JESUS CHRIST over our lives! So if this is how we look at ourselves, how can we love a neighbor as ourselves. How do we treat people kindly if we can’t even treat ourselves with love and respect? How do we tell people that God loves them if we do not even believe that His Love applies to us as well. In order to project love we have to first receive Love. To know the Father’s love is to Trust it! We are Loved regardless of our ugly past, we are Loved regardless of our ugly mistakes, and we are Loved despite our present blemishes inside and out. No you are not a label of the world! You are a child of The King of Kings, The Lord of lords. The One Who Can make ALL things New! The One who has wiped your past clean and remembers it no more. Your Lord is the one who restores the broken and projects them into victory! or maybe I should say Who will follow after The Great I AM? We are to be filled with His Love and overflowing so that we can share it with others. Will we allow ourselves to receive it? Will we soak in a love that is pure and true? Will we hold it up and look into The Face of Christ? Will we allow God to determine our worth or will we let the world decide? What have you been reflecting onto your neighbors? Are you passing out the labels that you have accepted? The Word of God says that You are Holy righteous and redeemed, you are cherished and treasured. 1Therefore be imitators of God, as beloved children; 2and walk in love, just as Christ also loved you and gave Himself up for us, an offering and a sacrifice to God as a fragrant aroma. Get to know Our Lord and Savior. He will Show You who you are as you become acquainted with His Love. 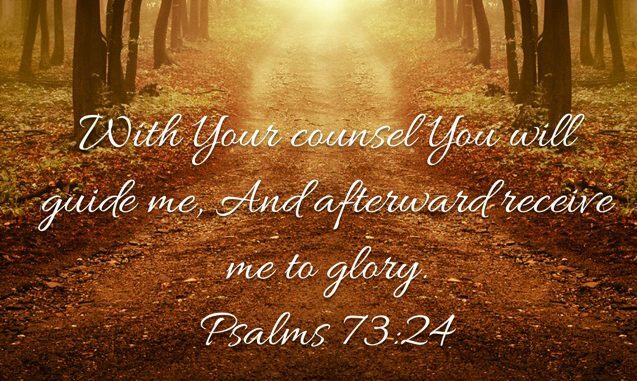 He will guide your steps towards His Will. To be self controlled is to be God Guided! The only way to truly know your full purpose and your potential is to receive it through His direction.